Lawn ornaments are still found in a great deal of yards, yet slowly they’re changing. It used to be you could watch them change as soon as there was a strong breeze. However, instead of these dragonflies flapping their wings with the wind, they are powered by the sun. Thankfully, they do still keep their power source eco-friendly, but in a slightly more hi-tech way. 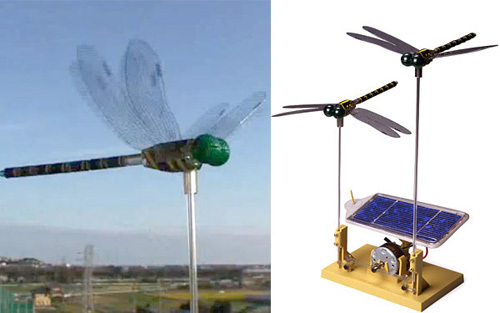 These solar powered dragonflies come in a set of two. Their textured wings make an attempt to make realistic movements. You’ll have to do some assembling yourself, but you won’t have to use any glue. You just snap together or screw parts of the dragonfly together. It does require a hobby knife, a side cutter and other basic tools. You can purchase the kit for $34.05 through Amazon.